After driving over 20,000km across North America, it's time to part ways with Verna aka "The Tank". She is a reliable companion who will surprise you with her durability and versatility. This car has plenty of space for your life on the road, enough to power to take you almost anywhere and is sure to make its next owner just as happy. It's the sports edition with a 3.8L engine. 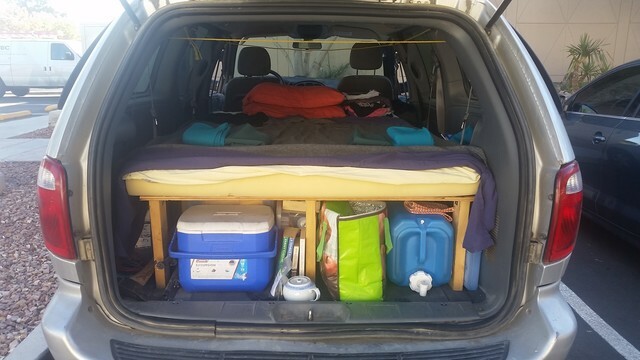 The camper setup will work for a single or couple. Whether you're looking for a winter or summer vehicle, Verna won't disappoint. - fully camperized including: wooden folding bed frame; foam mattress + pillows with sheets, covers and a duvet; towel; 2 camping chairs, 2 person tent, 2 sleeping bags (both rated for 0 degrees Celsius), self inflating sleeping mat, folding camping table, hammock, head torch and lamp + spare batteries, first aid kit, 10W solar panel, two 2 burner gas cookers, 15L cooler with ice brick, kitchen utensils (pots, pans, cutlery, chopping board, dish washing tub + soap and sponges, paper towel, cling wrap, aluminum foil, sandwich bags, mason jars, plastic storage containers, plates, bowls, water bottle etc. ); 2 tarps with poles; 20L water tank, 9.5L spare fuel tank, lots of rope, inflatable raft and water futon, air pump, axe, folding shovel, trowel, ice scraper/brush, working gloves and eye protection glasses, jumper cables, laundry detergent, bear spray, multi-tool, pocket knife, writing utensils, free camping in BC book + maps, tire pressure gauge pen. This car is fully loaded and ready to go!